While N.A.P. North American Poetry was released last February, I must admit I needed some time to absorb all of the earnestness emanating from this epigrammatic record. 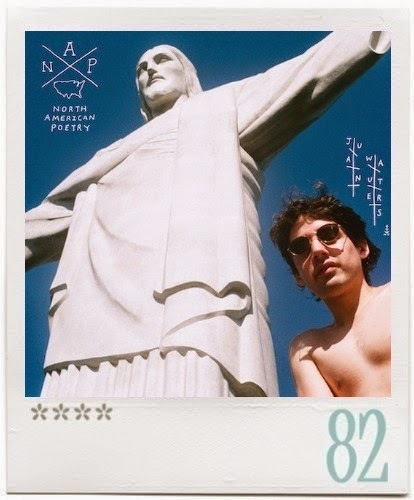 So I listened and re-listened to Juan Wauters' first solo LP. When it comes to achieving true simplicity -one that can only be attained by gathering, digesting and unifying the infinite complexities of human reasoning, the Jackson Heights-based fellow with the nasal vocals and minimalist guitar arrangements has become an expert. After several listens, his "collection of 12 songs about the coldness of winter and the warmth of a scratch-off nickel," which were all recorded at Gary Olson's Marlborough Farms studio between 2010 and 2012, uncovers the songwriter’s proficiency to understand and expose complex situations with an idiosyncratic lyricism that remains engaging. "I don’t like you, you’re a fool" shouts Wauters on album opener "Let Me Hip You To Something," after a discrete soaring guitar takeoff. The chuckle-inducing statement can offend upon first hearing, but in a way it calls into question whether he sings it in order to keep us, as a society, on our toes, aware, and truly present. Beneath his offhand irony, The Beets frontman bares a purity of conception that either excites or puts off. And so Wauters makes his way through and underneath the layers of our conscious minds, one moment with the genuine urgency of "Sanity or Not" and a moment later with the soothing bongo beat of the jaunty and Rollingstonesque "Lost in Soup." JW’s three-chord art punk provides a solid vessel for his thoughts on overconformity and the alienation of modern humanity. "Escucho Mucho" builds in a dreamy-jangly rhythm guitar to lines like "Soy un soldado, no estoy domado, a otro soldado quiero matar, pero no puedo, no tengo dedo apretar gatillo y matar." The hazy and drifting "Woke Up Feeling Like Sleeping," with its quieter strumming guitar, maracas and voiceover embodies Wauters’ aesthetic, one that’s weirdly attractive. His art excels with the contemplative "Water," whose words ("Do I belong, who is it that I am, what is it that I'm for") and music video (shot in Montevideo by longtime collaborator Matthew Voltz) create a sense that we have dropped in on a moment that has not stopped to exist because of our incursion. We can even catch a sight of two of Wauters musical idols Chicos Eléctricos’ Nico Barcia and singer songwriter Ruben Rada. Amanda Rodi’s flute on “Goo” and Carmelle Safdie’s (Beachniks) vocals on "Breathing" and "How Do They All Do?" envelop the confessional lyrics and JW’s slacker drawl with a fuller sensorial experience. Like a playful and spirited choir, the duet formed by Wauters and Safdie (a more fun and spirited version of Reed/Nico tandem), proves to be curiously effective as the vocal alternation channels Wauters’ vulnerability without becoming mawkish. "Continue To Be You" offers a different kind of thrill as lines from the opening track: “Get a headache yeah, take medicine yeah, get better yeah, to another headache, oh yeah” are repeated as a mantra to bring us to full realization. N.A.P. North American Poetry (out via Captured Tracks) closes with a rough but spirited cover of Los Piojos "Ay Ay Ay". The pressing guitar arrangements on this song are about someone who strives to survive outside of an alienating society, but inevitably comes back to it -giving it greater depth. Patti Smith in Just Kids explained that “to be an artist was to see what others could not.” Juan Wauters does precisely that: managing to hold the listener spellbound with few chords and a feeling. The candor and artisanal approach of his collection of thoughts permeates the ordinary to better transcend it.